Pangaea’s Sasquatch Stout combines two of my favorite things…Bigfoot (yeah that’s right…Bigfoot, Nessie, little green men from outer space…I believe in them all) and beer. This is not just any beer either. 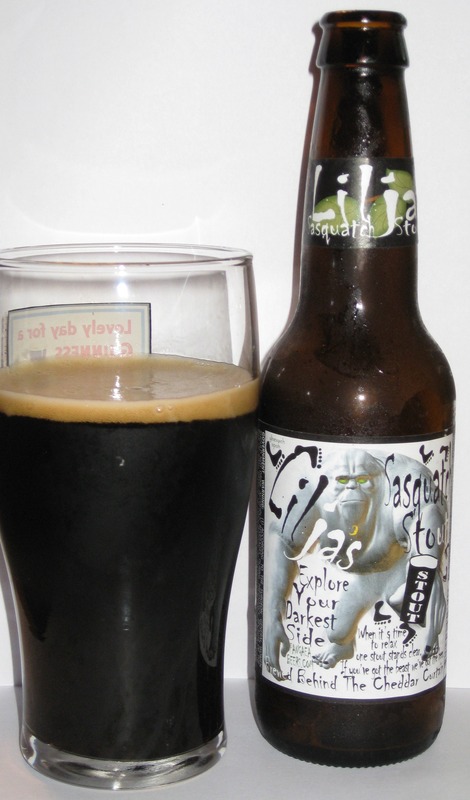 Sasquatch Stout is black…black and opaque. If not for the creamy tan head and the steady stream of bubbles rising from it’s murky depths, you could very easily convince yourself that you were about to drink a glass of tar. Yes…it’s that dark. Sasquatch Stout smells wonderful…all roasted malt with hints of chocolate. I bet the real Sasquatch wishes he smelled like this…might make it easier for him to pick up the girl Sasqatches if he smelled like roasted malt and chocolate instead of Sasquatch BO. Sorry that was an unexpected tangent, huh. Caught me by surprise too…won’t happen again. With Sasquatch Stout, Pangaea created a brew that is thick, rich and creamy. The roasted malt tastes as awesome as it smells and the chocolate and coffee tones come through beautifully. The strangest thing is sort of a surprise hoppiness that comes in the backdoor and sticks around for a bit between sips. It actually seems a bit like an oatmeal stout, but I haven’t seen it defined anywhere, so who knows for sure. I guess its a mystery just like Sasquatch himself. I wasn’t exactly sure what to expect from Sasquatch Stout. I’ve had a couple of Pangaea’s other brews and found them less than impressive. So I was a little apprehensive when it came to my first bottle of Sasqatch. Sasquatch Stout is actually quite a complex beer. Personally, I think it would make an awesome session ale…but at 7% ABV, a few people might disagree with me on that one. Without a doubt, you need to go pick up some Sasquatch Stout. Hop Devil IPA is an amazing beer, and it’s has been a favorite of mine for quite a while. Victory makes some awesome beer…just give their Storm King Imperial Stout a try if you don’t believe me. Hop Devil IPA is a rich golden ale. When I poured it into my tulip glass, a thick white head formed that lingered for several minutes. The aroma was sweet with intense grassy hop tones. 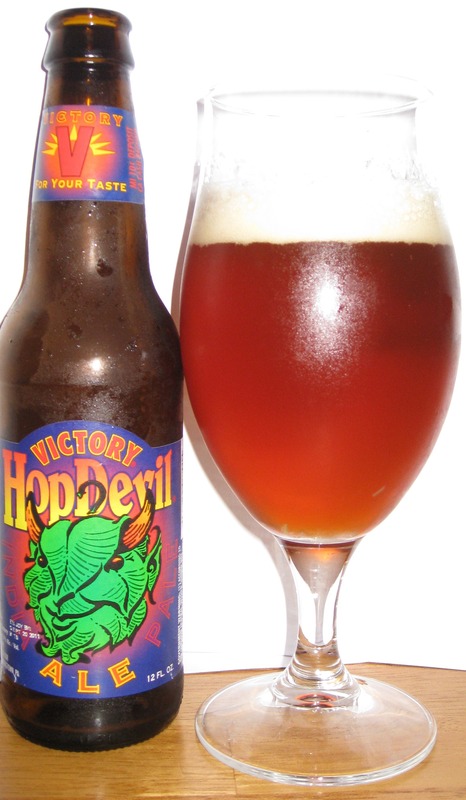 Hop Devil IPA is intensely intensely hoppy with dry bitter finish. I would love to know the IBU on this ale, not that it really matters. Hop Devil is definitely a stand out among IPA’s and is easily among my top 10 IPA’s if not in my top 10 favorite beers, period. This is one that you should definitely seek out. It is fantastic. It’s actually really awesome on draft as well if you can find it. Two words. Mother’s Milk, plain and simple. Or perhaps a hop-a-riffic nectar of the gods. I poured this fine beverage into my Goose Island tulip glass…not really sure what to expect. I’d enjoyed Squatter’s IPA and had high hopes for Hop Rising, their Double IPA. Hop Rising is a golden, honey-colored brew. When I initially poured it, a one inch off-white head formed, but it quickly dissipated leaving a thin white film. Hop Rising has a wonderful piney hop aroma coupled with the slightest maltiness (is maltiness actually a word?). This lovely ale is sweet at first with the slightest alcohol flavors. At 9%, some alcohol flavors are to be expected…so not a big deal. The initial sweetness is quickly overtaken by an intense though quite pleasant hoppiness. Hop Rising is crisp and clean, but with a fantastic complexity that challenges your senses. I personally found it thirst quenching as well as the perfect remedy to the stress of a long day. 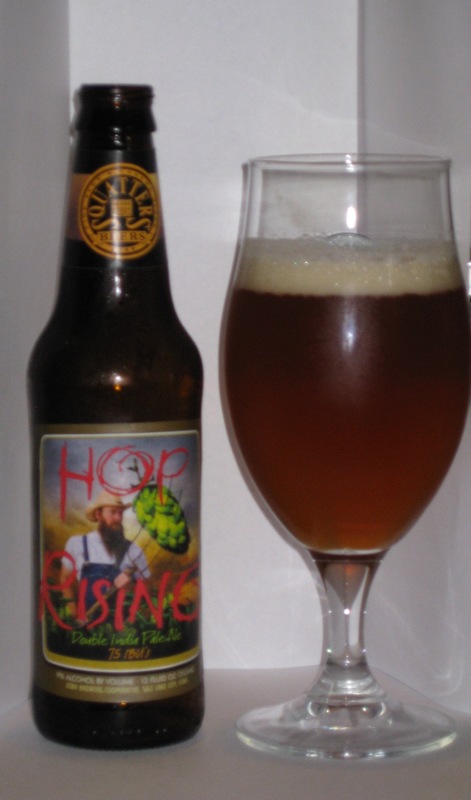 Squatter’s Beers’ Hop Rising Double IPA is a beer that I will definitely seek out as often as I can. At 9%ABV, its far from a session ale. 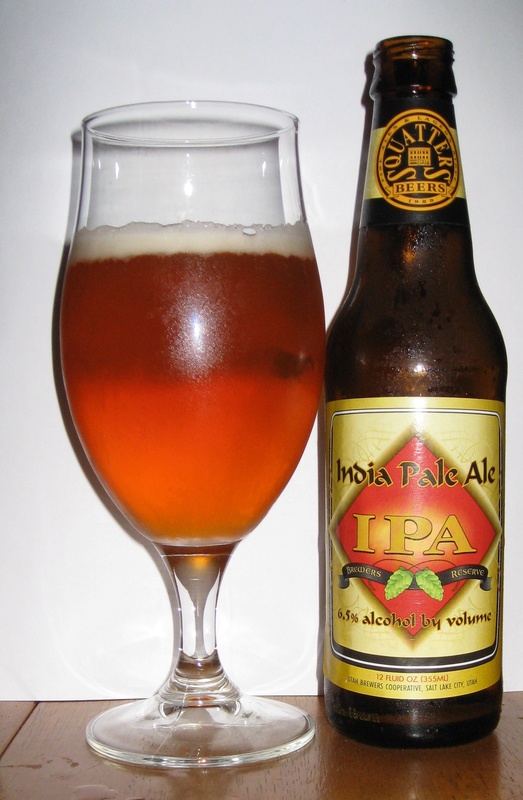 It is more a beer that you might start an evening with so that you can really enjoy the flavors and aromas. I find myself quite impressed with Squatter’s Beers and along with their brew am eager to track down some merchandise for purchase as I would be proud to wear a Squatter’s Beer’s t-shirt. I’m looking forward to sharing some Hop Rising with my dad as well as turning my friends on to this fine beverage. Drop me an e-mail at jfrank2264@gmail.com if you’d happen to know where I can get my hands on a Squatter’s Beers t-shirt. As of the writing of this review, their site appears to be having some issues, but hopefully it will be back up soon. I suggest you stop what you’re doing and run out right now to grab yourself some Hop Rising Double IPA. No worries. BeernShtuff will be here when you get back with more beer reviews and other cool beer stuff. I poured the Squatter’s IPA into my Goose Island tulip glass Honestly, I’ve yet to find a better glass when it comes to sipping an IPA than my trusty Goose Island tulip. Squatter’s IPA is certainly a pretty ale. It’s on the darker side of golden, edging slightly toward amber. It’s white head dissipates quickly leaving little more than a thin film floating atop the beer. The aroma is citrusy hop goodness all the way. I had to force myself to stop smelling it long enough to actually take a sip. At one point, I may have gotten my nose a little too close as I came away with beer dripping from the end. The first sip had a metallic, slightly sour flavor. I was concerned as I’d had such high hopes. However, the metallic flavor was quickly replaced by a nice hoppy citrus. The beer is crisp, clean and nicely effervescent. It finishes dry and the hop bitterness lingers on your tongue. I am pleased to say that after the first sip, the metallic/sour flavors never returned. I think it is safe to say there is more Squatter’s IPA in my future. I need some help with a ratings system. The stars thing is wearing a little thin. I’m also trying to figure out if I need a ratings system at all of if I should just give the facts, end with my opinion of the beer or my recommendation and leave it at that. Since starting on this process a few weeks ago, I’ve found the stars system a little unfair. So I’m sort of stuck. A letter grade seems a little weak as well. This is all my opinion without any right or wrong…so I don’t know exactly what to do. I’m way more comfortable drinking a beer and explaining it than grading it. I really am hoping over the course of this to expose myself to some beers and styles I might not have tried and along the way to turn you all on to some things you might not have tried before either. What do you think? I’m curious to hear what you have to say. if you want to send me a bottle one of your creations, I’ll taste it and do a write up here. I’m a home brewer too and always love the response the first time someone tries one of my beers. So if you’re interested, drop me an e-mail at jfrank2264@gmail.com and I’ll pass along mailing address. Ales, lagers, dark, light, malty, hoppy, whatever you all are creating…I’m eager to try it out. When I read that Shipwrecked Brewing Company’s Cherry Wheat Ale is brewed with fresh Door County cherry juice I was a bit frightened. We were just up in that neighborhood camping last week and we ate cherries until we nearly burst. That said, I know just how sweet they can be. The thought of a beer with that sweetness made me cringe. Wine coolers should be sweet. Beer should taste like the malt, the wheat or the hops with just a hint of other flavor. This is my opinion anyway, but it is why I don’t drink a lot of those fruit/wheat beers. Sorry. Have I rambled long enough? Good. Let’s move on. I poured my glass of Cherry Wheat Ale. It was golden in color, though I swear my eye caught the slightest bit of red. I could be imagining things. Now that I’m getting older, my mind tends to wander. It had a nice white head that was about an inch thick and it seemed to linger a while and caused me to get bit of a “beer foam mustache”. Cherry Wheat Ale smells malty with a strong cherry aroma. The first thought to pop into my head was Kool-Aid. That’s not necessarily a bad thing. Trust me…some of my fondest childhood memories involve an ice cold glass of Kool-aid. The first sip was sort of odd. I was expecting and even dreading a ridiculously sweet, cherry flavored beer, but the first thing to hit my tongue wasn’t cherry at all, but a pleasant sweetness, a bit of the sort of rich wheat flavor that sometimes is reminiscent of banana…and the slightest hint of cherry that seemed to sneak in the backdoor. In case you couldn’t tell from my babbling at the start of this, I don’t care much for Fruit/wheat concoctions. 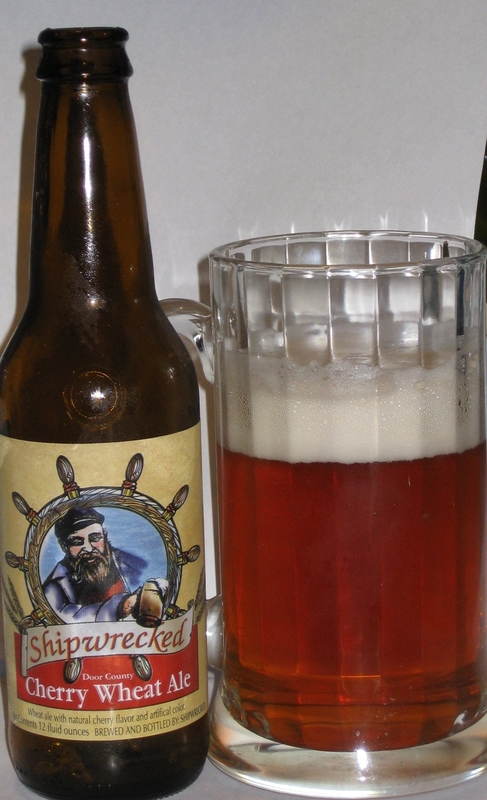 However, Shipwrecked Brewing’s Cherry Wheat Ale was enjoyable and was actually a pleasant surprise. I’d say it’s probably a 3 and a half star beer as I’m not sure that I would have another…I’d much rather have a pint of the Shipwrecked IPA or even their Peninsula Porter, but I think Cherry Wheat Ale is a good beer. This lovely blonde ale is brewed by Door County Wisconsin’s only brew pub. For some, being the only game in town might make you a bit complacent, but not these guys. 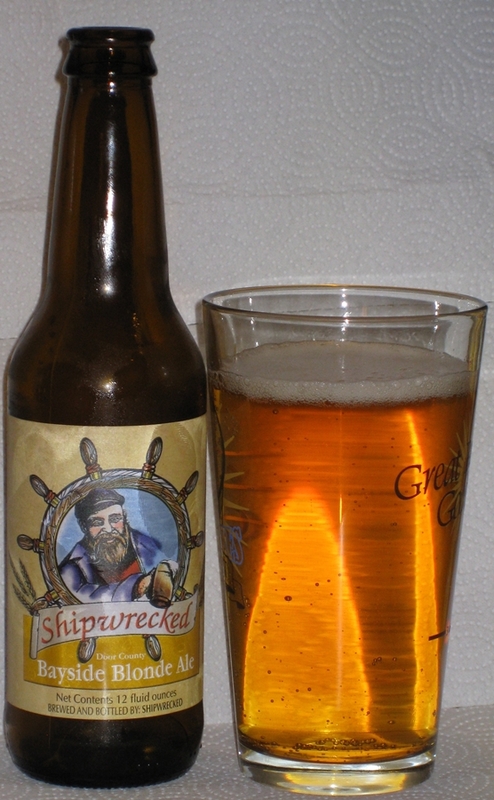 I’ll go into some of Shipwrecked’s other offering over the coming days and weeks, but you can be sure that when you grab a pint of shipwrecked ale, they’re brewing their very best for you. I don’t drink many blonde ales. I’ll say that up front. So maybe I’m not the best judge of this style. As I poured the golden, yellow ale into one of my many Great Lakes Brewfest souvenir glasses, I was honestly expecting not to like it. I was hoping that at best, I could give a fair review. I held the glass to my nose…then took a few seconds to watch as the white head quickly dissipated. I took another whiff and found the aroma to be sweet and malty. Bayside Blonde is crisp, clean and nicely carbonated. It’s sweet with the slightest bit of bitterness at the finish. This ale goes down nice and easy…seems like it would make a great session ale. As I mentioned at the beginning, I don’t make a habit of chasing blondes. It’s just not my style, but this ale makes me think that maybe I should give blonde ales another chance. I’d say that Shipwrecked Brewing Company’s Bayside Blonde is a 4 star example of just how great a blonde can be. Sorry it’s been a while, I’ve been camping in Door County in Wisconsin…and will actually have a bunch of new reviews related to that trek in the coming days…but here is my latest review. 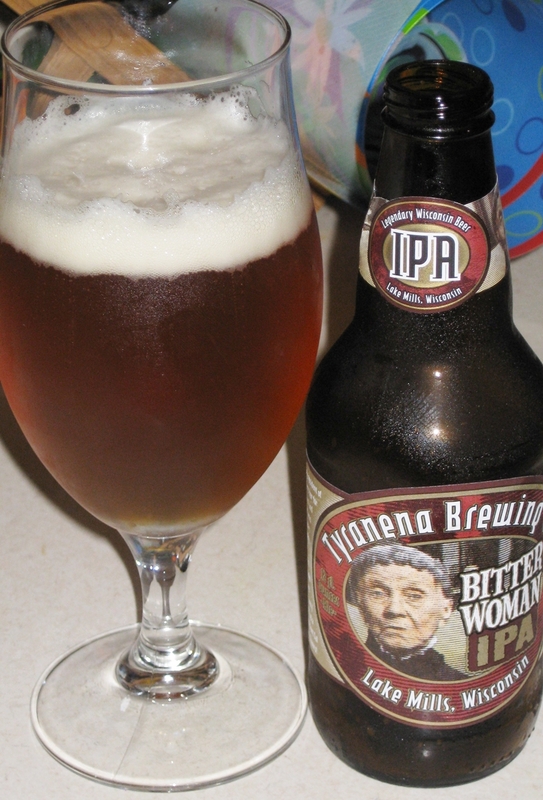 Tyranena Brewing Company calls Bitter Woman IPA a “Wisconsin version of an IPA”. It is named in honor of an early Lake Mills, WI resident named “Aunt Cal” who was romantically linked to Henry Wadsworth Longfellow. I grabbed my trusty tulip glass and poured my bottle of Bitter Woman. The ale was golden, almost orange in color, sporting a thin white head that clung to the glass. The aroma is sweet yet with a strong floral hoppiness. Not to get too sappy here, but I sometimes think that if there’s a heaven, I hope it smells like Bitter Woman IPA. The first thing to hit your tongue is the sweetness of the malt…which is quickly swept away by an intense hoppy bitterness that lingers in your mouth, teasing the goodness that awaits you in the rest of the glass. This IPA has long been one of my favorites. I think I’ve recommended it to everyone I know that drinks beer at some point. It’s a beer that hopheads will love instantly but might be a little bit intense for those that are new to the style. Bitter Woman IPA is a beer that I personally look forward to drinking on tap every year the Great Lakes Brewfest. It is a beer that I know I can count when I am in need of a crisp, refreshing IPA. In my opinion…this is a 5 star beer. Track it down, give it a try. I think you’ll love it. Upland Brewing Company’s website states that Dragonfly IPA features 7 hop additions. On paper, that’s enough to make any hophead drool. In reality, Dragonfly really was a bit of a let down. I poured my Dragonfly IPA into one of my favorite Great Lakes Brewfest pint glasses. It is golden in color and had a little bit of white foam on top that dissipated rather quickly. It appears to be unfiltered though I can’t find any reference to that on the Upland site or on the bottle. The aroma is malty and sweet with a citrusy hop tone beneath. 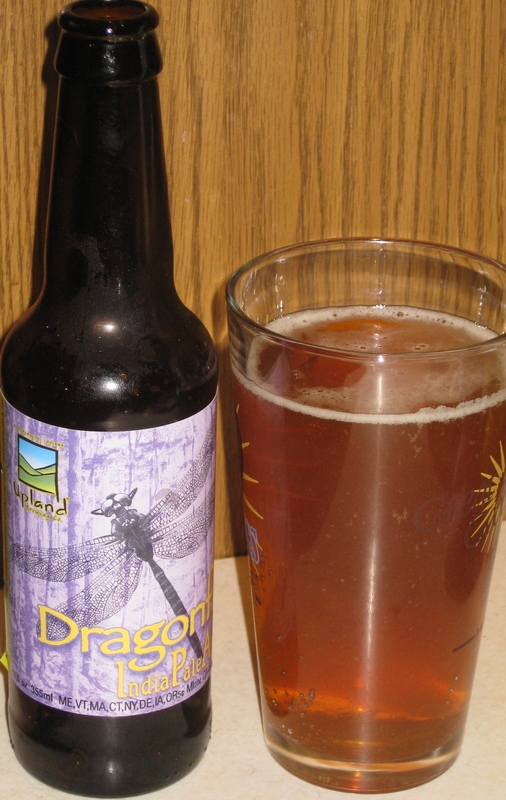 Dragonfly IPA is light and crisp, but the initial flavor to hit my tongue is a slight metallic taste. However it quickly fades to a malty sweetness with sort of grassy hop flavor and has a dry finish. This is not an IPA that I will be drinking more of. It may be the right beer for someone…and really is not a bad example of an IPA, but when a brewer makes a point of saying that a beer has had 7 hop additions, that sets certain expectations and Dragonfly let me down. I’d say this is probably 3 stars, but it is not the beer for me. I certainly will not be recommending it to my friends. Should they find it on their own…they can proceed at their own risk and form their own opinions.